Note: these Rules and Regulations reflect, in part, recent amendments adopted on February 15, 2019, to Rule 25 regarding storage of boats on Club properties. Effective February 15, 2019, previous permanent boat dock space assignments remain in place though no further assignment of spaces will take place. 2. All the Club’s facilities, services and activities are totally supported by the payment of the initiation fees and assessments which are established by the Club’s Voting Board, from time to time, pursuant to the By-Laws and such fees and assessments must be paid in full in order to obtain current badges. A copy of the initiation fees and assessments currently in effect may be obtained at the Club Office. 4. Adults must accompany all children requiring supervision while on Club property. 8. 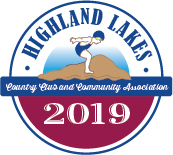 All docks must be registered with the Club and display a current Highland Lakes sticker. 9. Applicable fishing and fire prevention laws of the State of New Jersey must be complied with at all times. 10. Children are constantly using the roads – everyone must drive slowly and otherwise comply with the New Jersey motor vehicle laws. 11. 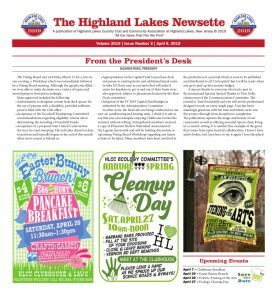 No air rifle or air guns of any type may be discharged anywhere within the Highland Lakes community and applicable New Jersey laws governing the use of firearms must be strictly observed. 13. No house trailers or mobile homes of any type shall be used as residences anywhere in the Highland Lakes community. 14. Unless special permission is first obtained for use during later hours, the Clubhouse curfew shall be 11 pm Sunday through Friday and 12 midnight on Saturday. 16. Since the width of the right of way of the Club’s roads generally exceeds that of the actual road bed, no obstruction shall be placed nor structures built beyond any individual property line so as to extend into the right of way. 17. No member shall post or inscribe any signs on Club property. Any such signs or inscriptions will be removed or eradicated at the Club’s convenience. 18. Whenever snow has fallen or roads become covered with ice and the accumulation is such that it covers the roadway, an emergency shall exist and no vehicle shall be parked on any roadway or portion thereof. This parking prohibition shall remain in effect after the precipitation has ceased until the roads have been plowed and/or sanded sufficiently and to the extent that parking will not interfere with the normal flow of traffic. Any unattended vehicle in violation of this Rule will be deemed to be parked without the consent of the Club and may be summonsed and towed in accordance with N.J.S.A. 39:4-56.6. 19. No Club facility shall be used for purpose of personal profit. Any exception shall be by approval of the Voting Board. 20. Any member who blocks a fire lane with a parked motor vehicle shall be liable for a twenty-five ($25.00) special assessment payable no later than 15 days following the occurrence. Any such assessment outstanding after 15 days will be subject to the Club’s current late payment penalty. 21. Bicycles are prohibited from all beach areas. Bicycles brought to the beach must be stored in designated areas. 22. In the event that a written complaint is made to the Voting Board by any Active or Associate Member of the Club, or an employee of the Club, or any volunteer of the Club, alleging that another Active or Associate Member, or a member of the immediate family of such other Active or Associate Member, has violated any of the By-Laws or Rules and Regulations of the Club and the Voting Board has reasonable grounds to believe that such violation has occurred, the Voting Board may, by an affirmative vote of not less than two-thirds (2/3) of its members present and voting at any regular meeting of the Voting Board or at any other meeting specially called for that purpose, take such disciplinary action against such Active or Associate member as it deems appropriate, including, but not limited to, the imposition of a monetary fine and/or the temporary suspension of membership privileges, provided that written notice of the details of the alleged violation and of the proposed disciplinary action shall have been mailed to such Active or Associate member at least thirty (30) days prior to the time of the meeting, which notice shall also apprise such Active or Associate Member that he may be heard and represented by an attorney at such meeting prior to the time of the taking of the vote on such disciplinary action. 23. Members may park their licensed motor vehicles with current Club parking permits on Club properties as defined in Rule No. 15 if the Club’s facilities are being used by the member, or with permission from the Club office. Parking in violation of this Rule shall be subject to a special assessment of $50.00 for the first offense, and $250.00 for each subsequent offense occurring within twelve months of the first offense. A third violation of this Rule within twelve months of the first offense constitutes parking without the consent of the Club, and the vehicle may be summonsed and towed in accordance with N.J.S.A. 39:4-56.6. Parking along roadways during snow and ice removal operations is regulated elsewhere in these Rules and Regulations. This Rule does not apply to unattended overnight parking caused by storm and related weather events. Unattended overflow parking needed by members for parties and gatherings at their residences is permitted, provided that permission is first obtained from the Club office. 24. No Active or Associate member, or member of the immediate family of such Active or Associate member shall conduct themselves in such a manner as to disrupt the permitted activities of any member, group of members or any organization authorized by the club to conduct such activities on Club property. Any person in violation of this rule will be subject to removal from the premises, as well as further disciplinary action pursuant to Rule 22. Members are responsible for activities of their family members, guests and invitees and violations committed by family members, guests and invitees may result in disciplinary action against the member pursuant to Rule 22. 25. These Rules, in six parts, constitute the Club’s Rules pertaining to the storage of boats, kayaks, windsurfers, etc. on Club lands, boat racks and docks. A. HOLD HARMLESS: The member agrees to indemnify and hold the Club harmless from any injury, damage or loss resulting from the use and storage of the member’s boat anywhere on Club property, including but not limited to lands, waters, docks and boat racks. The member, by keeping their boat on Club lands, waters, docks or boat racks, acknowledges that the Club shall not be responsible for any injury, damage or loss whatsoever resulting from the removal, transport and/or storage of the boat, and the use of the Club’s lands, waters, docks and boat racks. B. IMPROPER STORAGE: Improper storage is defined as storage on lands and waters owned by the Club other than on docks and boat racks, storage anywhere on Club properties without a current membership permit, and storage in violation of this Rule 25 (C.), (D.) and/or (E.) below. Boats improperly stored will be removed to storage immediately. C. STORAGE ON DOCKS and RACKS AFTER OCTOBER 15: All boats must be removed from Club docks not later than October 15 of each year. In alternating years, all boats must be removed from boat racks by October 15, as determined by the Boat Dock committee and as published in the Newsette. Boats stored after October 15 in violation of this Rule will be removed in accordance with Paragraph F. of this Rule. D. UNAUTHORIZED USE OF SPACE ON ASSIGNED DOCK: Use of spaces on docks located at Club Park, Comet Row, Eckhart Sailing Center, Beach 3, and Beach 4 were previously subject to assignment only, after receipt of applications by the Boat Dock Committee using a lottery and other methods. Effective February 15, 2019, previous space assignments remain in place though no further assignment of spaces will take place. All unassigned boat dock spaces, and all dock spaces permanently assigned as of February 15, 2019, which are forfeited in the future, will have their existing, numbered tag removed and replaced with a new tag of a contrasting color containing the space number, the word “OPEN”, and a graphic depicting the type of boat appropriate for the space as determined by the Boat Dock Committee. These spaces marked “OPEN” are available to all members in good standing with current boating permits. Members without permanent assignment may place their boat in “OPEN” spaces only. Otherwise, the boat will be removed to storage immediately – see Paragraph B. of this Rule. F. TRANSPORT TO RESIDENCE, REMOVAL TO STORAGE, PENALTIES FOR VIOLATIONS: Boats, kayaks, windsurfers, etc. of members stored in violation of these Rules which can be identified will be returned to the member’s residence. Boats which cannot be identified shall be removed to storage. 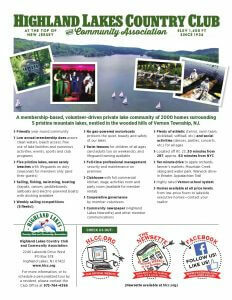 All boat removals will be subject to a special assessment of $100.00. A daily storage charge of $5.00, calculated from the date the boat was removed to storage up to December 15 will be imposed, when a special winter storage fee of $250.00 will then be imposed. After June 15, a disposal fee of $250.00 will be imposed. Boats may not be retrieved between December 15 and April 15. The Club may, in its sole discretion, elect to acquire title to any boat that has been determined to be abandoned, in compliance with the “Abandoned Vessels Disposition Law,” N.J.S.A. 12:7C-7 et seq. 26. No person shall: a. feed any waterfowl; b. create any condition, or allow any condition to exist, which results in a congestion of waterfowl that causes: a. an accumulation of waterfowl feces or droppings, b. damage to flora, fauna, private or public property, c. a threat or nuisance to the public health, safety or welfare, or d. a threat to the health, safety or welfare of said waterfowl. 28. Skateboarding and roller blading are prohibited at Beach 1 except for the Utility Court. 29. Persons under the age of 18 are prohibited from using any and all tobacco products while on Club property.